German Industry UK (GIUK) has been in discussion with John Hayes MP, Minister of State for Further Education, Skills and Lifelong Learning. Conversations regarding the development of German models of vocational training to benefit the UK economy have led GIUK to develop a proposal for progressing UK Apprenticeship schemes to become more successful. Britain has been pretty good in training its elites but has neglected the training of “foot soldiers” for decades. If one wants to turn innovations into successful products, one needs both, and if David Cameron’s “Big Society” is to have any meaning in further education then his government has to look at apprenticeships in a new structured manner. John Hayes himself recently made an announcement regarding the government’s commitment to progressing Apprenticeship schemes in the UK, saying “We must create a radically new model for workplace training, with apprenticeships at its heart”. In view of John Hayes’ statement, during a meeting between GIUK and Mr Hayes on 3 February 2010, about his interest in bringing key elements of the German Dual Vocational Training System to Britain, GERMAN INDUSTRY UK has developed the following proposal. GIUK is of the opinion that the present UK apprentice training system requires simplifying, restructuring and more relevant content, for companies to buy into it. Since successive governments largely abandoned apprenticeships, a vacuum was created, which has been filled with a myriad of well-meaning but chaotic initiatives, duplicating many efforts and lacking structure and transparency. From comparisons with continental systems we are also sure that it is possible to reduce cost drastically whilst increasing transparency and efficacy. The German government spends around Euro 1,9 bn per annum on its Vocational Training Colleges and the certification of apprentices through local chambers of industry and commerce. German industry spends around Euro 18.5 bn p.a. net on training apprentices. Around 650,000 youngsters (or 58% of school leavers) enter into apprenticeships every year. The completion rate is always well over 90%. In total, there are approximately 1.6 million youngsters training as apprentices in Germany, at any one time, at a cost to the state of about Euro 1,200 ( GBP 1,000) per person p.a. and about Euro 12,000 ( GBP 10,000) per person p.a. for the employers. A budget needs to be agreed by the Minister for Skills. Once the basis of the above has been agreed with the government and work commences, GERMAN INDUSTRY UK will actively support the new apprenticeships and will encourage its members to take on as many young people as possible as apprentices. When Paul Polman, CEO of Unilever, recently echoed the words of Jack Welch about shareholder value being the”dumbest thing in the world” and by adding that “it’s easy to be a short-term hero. It’s easy for me to have tremendous results very short term, get that translated into compensation and be off sailing in the Bahamas”, he re-started an old argument that was considered to be settled long ago. When he described the shareholder value model as a “misguided and potentially harmful goal for companies to pursue”, he was really saying that a narrow interpretation of the shareholder value concept, based on short-term profit and share options and annual bonuses can be harmful. However, if one is looking after all stakeholders – including customers, suppliers, employees and the environment – shareholder value is optimised as a result. Such enlightened perspectives on a company’s aims need to be translated into clear guidelines for managers, and the adoption of a different incentive structure to reflect this. If the bottom line alone is no longer the basis of a steering mechanism for the company and its top management, what is? What kind of incentive system should be put in place to make management target sustainable economic profit growth over short-term profit maximisation to drive the share price up? The undisputed aim of companies all over the world is to make a profit for owners by increasing value and paying dividends. Privately owned and managed businesses look automatically more to the long-term survival of their companies and seem to adhere to the formula per se. There has always been anecdotal evidence that these companies have a systemic advantage over the share-price-driven public companies. Recently there has been proof that privately owned companies have better allocation of capital than public companies. New York University examined almost 100.000 companies with the help of a database compiled by Sageworks and found that the privately owned companies invested more than twice as much as quoted companies and were more responsive to investment opportunities. So how could public companies be encouraged to behave more like privately owned ones? Creating an alignment of a company’s aims with the aspirations of its management is the job, in publicly quoted companies, of the board’s remuneration committee. As the worldwide economic crisis has thrown a harsh spotlight on the shortcomings of a number of companies and sectors, there appears now more than ever in the last 20 years a willingness to re-examine the old ways and look for alternatives. The recent banking crisis provides some examples. Did it make sense to pay gargantuan bonuses on revenue and profits without regard to the risk that was taken to achieve them? Did it make sense to pay such bonuses based on single-year results? Most would agree that it did not. The remuneration committees in all banks are looking at three to five year rolling bonuses schemes at present and if they are not yet, they should. One problem with simple profit-related schemes is that they rely on the company’s audited profits defined by accounting standards rather than by economic considerations and can therefore be subject to short-term manipulation or “gaming” of results. We therefore advocate economic profit as the basis for remuneration because it includes all revenues and operating as well as capital costs. We also advocate the use of a bonus bank so that in good years some portion of bonuses are held back and remain at risk to encourage sustainable performance improvements over future years. However, even when profit as the criteria for remuneration is taken over a longer period than the accounting year, the potential of misalignment remains. It can have many guises. In capital intensive industries where depreciation of plant and equipment is a significant expense, the temptation to postpone – or totally avoid – new investment is strong, and, as a consequence, they continue to work with outdated machinery. It improves the bottom line and the managers’ earnings in the short term, but “savings” of this kind clearly affect the long-term competitiveness of the business. Over time the costs of maintenance and repairs increase, quality falls as the machinery ages and the proportion of rejects and unproductive downtime increase. 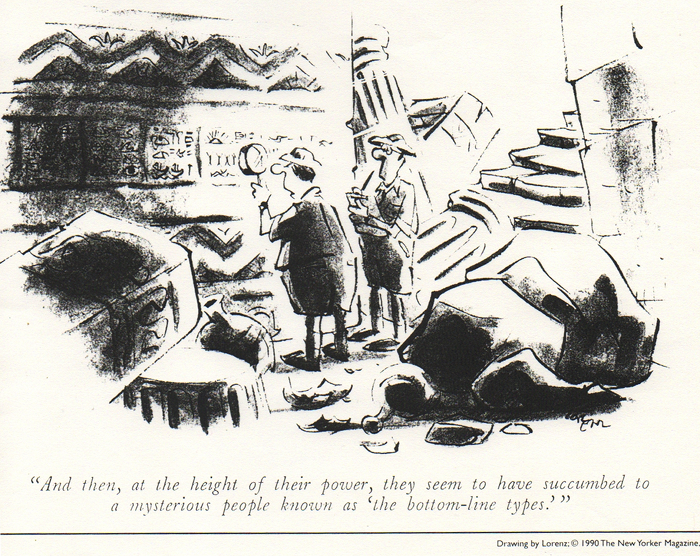 Large parts of the indigenous car industry in the US and UK were examples of such behaviour, where depreciation had sunk to near zero to make these companies appear better than they were and allow their managers to still pocket bonuses – until they were bought by unsuspecting foreign investors or filed for Chapter 11. We recommend therefore to learn from what many European manufacturing companies already do. Their definition of economic profit includes notional depreciation on the replacement value of all production plant and machinery independent of age and residual value on the balance sheet, thus making the decision free from accounting rules and solely subject to economic considerations. If the difference between accounting standards depreciation and notional depreciation on replacement value were deducted, many companies’ annual results would look quite different. In sectors where prospects depend greatly on Research and Development (R&D), like the pharmaceutical industry, amortizing R&D over a multi-year period versus the accounting approach of expensing it in the current period ensures that R&D is truly treated as an investment. It removes the incentive to cut R&D in any single period just to “make the numbers.” In other words, here economic profit would be greater than the accounts profit and more equally spread. The same goes for the “investment” in product development, particularly important in all fast-moving consumer goods producing sectors. The important thing is to look at every company and sector individually, when designing incentive systems for the longer term. Of course there is a trade-off in making these adjustments that must be considered, as every adjustment needs to be tracked over time and made transparent to the participants of an economic profit-related incentive scheme. So ideally they need to be kept to a minimum, be tailor-made for the company’s aims and be as transparent and cost-effective as possible. By approaching the definition of economic profit in a flexible manner, one can get management support for it and drive the right behaviour to ensure not only the long-term survival but also sustainable economic profit growth of the company. This approach needs not only chairmen of remuneration committees who are truly independent in their dealings with executive directors but who are also able to communicate the companies’ aims to their shareholders. There has been a lot of talk about re-balancing the economy and the new government in the UK wants to make a difference – as the last one intended – and at least arrest the decline of manufacturing industries and narrow the trade gap. For the Obama administration the task is not dissimilar – just so much larger. Changing economic behaviour would be a starting point. Numbers of so-called NEETS (young people Not in Employment, Education or Training) have risen to close to a million and over a million 16-19 year olds are out of work – the highest in Europe. In the Lisbon Treaty of 2000 European leaders committed their governments among other aims to the promotion of Vocational Education and Training (VET) and expressively recognized that it has not only an economic but also a strong social dimension as Germany proves with the lowest unemployment rate among young people in Europe. In the follow-up meetings in Copenhagen in 2002 (Copenhagen Declaration), Maastricht 2004 and Helsinki 2006, targets were set and monitored to improve and modernise vocational training by 2010 for young and old and start the process of a European Vocational Framework, which would allow more mobility between countries and recognition of each other’s certification regimes. In the Brussels follow-up meeting in 2008 it was recognized that most of the targets set for 2010 were going to be missed, as they were too ambitious. However, as times are changing now, the problem is supposed to be addressed with renewed vigour or will it? There is some doubt that there is real energy spent on it. German Industry UK (GIUK), an association of German businesses in this country, launched a survey of its members in 2008 regarding employability and availability of skilled people in the UK. The survey showed that German managers were confused about the diversity of offerings in vocational training and certifications and considered the general lack of young people, who would qualify for vocational training a drag on their businesses. My own experience in UK manufacturing and logistics bears this out. In October 2008 and with some prodding from the Prime Minister, GIUK went on a 3-day fact finding tour to Germany with David Lammy, then Minister for Skills and three assistants to study the German dual apprenticeship system and visit a number of firms. The team was impressed. The minister promised to engage with GIUK, however before he could act he was promoted and handed over to Lord Young, who promised to pick up where David Lammy had left off. Three months later he was moved on. German Industry, which employs directly and indirectly around a million people in the UK, had promised more apprenticeship places in return for involvement in the curricula and the overdue simplification and streamlining process of apprenticeships. GIUK – speaking for its members – is clearly saying that the present system is preventing German business from being as competitive in their UK operations as elsewhere and demanding change. This is particularly important in manufacturing, however skills are important everywhere including the public sector. We believe that at the heart of the problem in the UK is an at best well-intentioned and at worst spin-inspired attempt to make everybody into a “kind of academic” in the so-called “knowledge economy”. What is the definition of the “knowledge economy” anyway? We don’t think it included in the minds of most politicians and educationalists skilled technicians, plumbers or carpenters. By going hell for leather for academia, it “devalued as an unintended consequence the craft skills and vocational training per se” – so the last but one Minister for Skills Lord Young at a German-British Apprenticeship seminar in London organised by GIUK. The second big slogan of the Blair era was “no jobs for life”. In our view it was just as misleading and un-differentiated as the “knowledge economy”. “No jobs for life” sounded like encouraging employees to job hop and a fig leaf for employers for a “hire and fire” culture. It is of course based on the idea of old industries versus new, on “creative destruction” and the supremacy of the service sector. There is some merit in all this, but it sits badly with youngsters starting off their careers. Why train, when I am changing jobs permanently? At Volkswagen and Vauxhall alike there are third generation of employees and they are proud of their commitment to their companies. The new “Skills for Life” slogan and the creation of a “technical class” sound good but need substance. Government thinking is changing – and not a moment too soon. The PM himself should re-state and clarify government policy in this area. Job hoppers do not produce quality work nor enhance productivity in companies as a rule. The economic downturn and the crises of confidence in the present economic model present as much a problem as a rare opportunity to redraw the lines. It is safer again for politicians to look east towards Europe for values and inspiration after the disaster created by following the US lead in so many areas over the last decades. The economy clearly needs rebalancing and Brits will have to look again to doing things themselves rather than looking for Johnny Foreigner to make the dishwashers and come over here to repair them, when they break down. If apprenticeships and training are to be taken seriously and beyond political fad, there needs to be a change of culture regarding skilled employees – or human resources generally. Highly skilled jobs need to be better safeguarded during cyclical downturns. During this recession unemployment in the US rose by over 8 million, in the UK by about 1.4 million and in Germany the jobless number rose by just 220,000, although the latter has been experiencing the biggest economic downturn since the war. Who is going to be ready and first out of the blocks, when things get back to normal? Who on the other hand has to spent £10,5bn so far in this crises alone on redundancy payments and later probably the same again in recruitment and training costs let alone the cost of the missed chances in the market place in the next upswing? Why can German companies hang on longer to their skilled employees? The answer is simple. As they pay half the hypothecated employment insurance (2.8% of gross income), the employers are entitled by law to apply for short time work (Kurzarbeit) in a cyclical downturn. This means, if there is only work for two or three days a week, they can keep all their staff and the employees get paid for the full week. Unemployment benefit is also paid out of this pot. During times of low unemployment and little or no short time working the hypothecated pot swells up and acts in an anti-cyclical manner in downturns. Germany’s pot was quite full, when this recession hit. This 2.8% pot incidentally also pays for the vocational college education of apprentices and the advice they are given before, during and after their apprenticeships through the jobcentres and for their certification/examination by the Chambers of Industry and Commerce. The cost of a proper apprenticeship training system could be recovered easily also by “social cost savings”, which could be achieved from a reduction in the hidden costs in Britain occurred through the highest youth alcoholism and drugs dependency, teenage pregnancy, young offenders and truancy rates in Europe – in other words the cost of the so-called “lost generation”. If we want to be serious in this country about training and social cohesion, it is our view that these points need to be addressed urgently. GIUK in conjunction with the German British Forum and German British Chambers are planning a series of conferences in Britain and Germany to further these ideas. 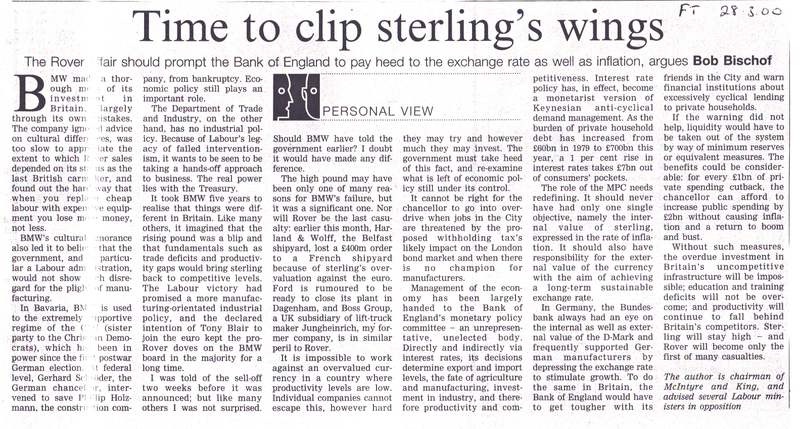 This article appeared in The Observer 21 March 2004 – and perhaps can be considered to still have relevance today…. 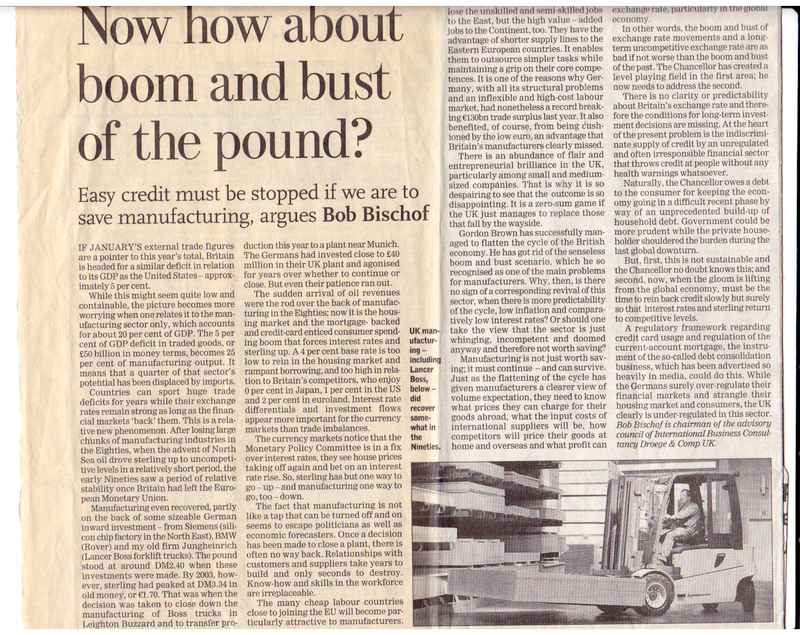 This article appeared in the Financial Times 28 March 2000. Click to view full size for reading.